"There are few aromas that are as enticing as the smell of freshly roasted nuts!" I had this thought while sipping my Soothing Caramel Bedtime tea and contemplating where I should or should not start a batch of Roasted Almond at 10 PM. Post 9:30 PM is a sacred time for me. Its my 'alone time', my 'quite time', my 'me time'; call it whatever, it is my most precious time of the day. But when you have Orange and Rosemary, with a generous sprinkle of Smoked Salt wafting through your mind, you really can't concentrate on yourself. Not fully, anyways! I have been hunting for Roasted Almonds for quite sometimes now. I have read plenty of recipes but none of them made me leave the couch and head towards the kitchen. All I knew Smoked Sea Salt had to be an ingredient, mainly because I had impulsively grabbed a bottle off the shelf, without a clue as to when, where and how I'm going to use it. And it had to had Rosemary! Because the gorgeous and gracious Cocoawind gave me some from her herb garden and I needed to find a use for them. Rosemary is slightly less loved, in my herb loving heart. It's a strong herb and tad overpowering, especially in the types of food that I cook. But it is just perfect for Roasted Almonds. You need its astringency to balance the neutral taste of almonds. But I was clueless on what to more add, to complement the overpowering flavor of Rosemary. The fruity, citrus(y) scent of the Orange zest complements the woodsy aroma of Rosemary perfectly. And it all comes together with some smoky Sea Salt and sweet Honey - a perfect harmony of flavors. A li'l sweet, a li'l savory; crunchy and oh-so aromatic. Perfect way to greet your guests this holiday season or gift them in cute baggies or jars. 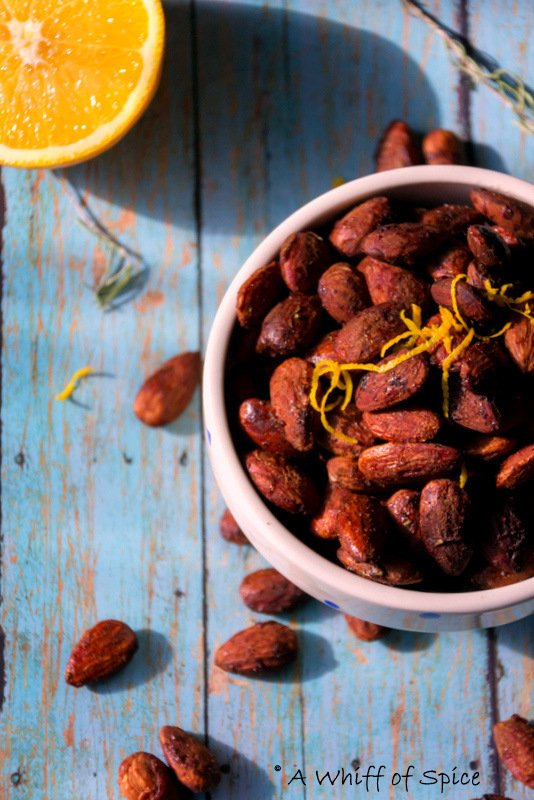 These Orange - Rosemary and Smoked Salt Roasted Almonds are irresistible. 1. Preheat the oven at 350F and line a half sheet tray with parchment or greased aluminium foil. 2. In a large bowl, add the egg white and beat it till frothy. 3. Add the oil and honey and give it a good whisk. 4. 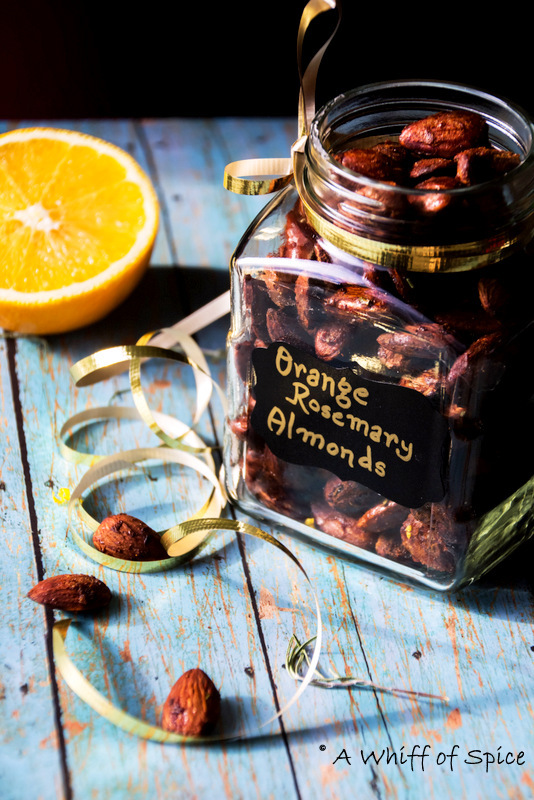 Add the almonds, 1 teaspoon of smoked salt, orange zest and 1 tablespoon of rosemary leaves and give it a good toss, ensuring that all the almonds are well coated with the seasoning. 5. Spread nuts in a single layer on prepared baking sheet. 6. Bake for 30 minutes, stirring every 10 minutes to prevent them from sticking. The nuts are done when they appear dry and toasted and the kitchen is filled with a wonderful aroma. 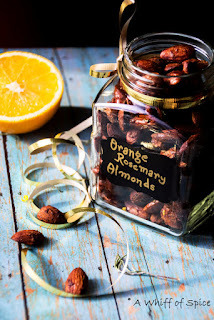 Notes/Tip: Lets the almonds cool for at least 10 minutes before serving or storing. Store in a airtight jar in a cool place. Orange - Rosemary and Smoked Salt Roasted Almonds relates to such a unique and real tatsy almonds just like the name itself. Almonds have always been essential for brain especially when they taste awsome. Coconut Oil - Miracle or Debacle?